The reason I was looking at cordless weed wackers is pretty simple. If you are like me you have been messing around with gas powered weed eaters and got pretty annoyed with them. I have changed to a battery powered, rechargeable cordless weed eater and will never use a gas powered one anymore. This makes my life so much easier and I don’t have to mess with gas tanks, not starting, flooded, dirty spark-plugs and all other things anymore. Keep it charged, click the battery in and start weeding. I had a look at the 3 best electric string trimmers to buy. This is my personal choice and I advise you to do your own research but I think these 3 electric string trimmers are pretty good. They are in random order. This means that I do not suggest one over the other. TIP! Find my 3 recommendations Here! Let’s have a good look at this weed eater from Black and Decker. The first thing I noticed was the 60 Volts and that is the highest voltage I have been able to find up to now. More volts does not always mean more power but it had an effect on the strength of the weed wacker. Remember at home that the heavier equipment runs on 220 and not on 119 volts? This trimmer feeds the line with no bumping, but by pressing a button. I think this a nice feature because my experience with bumping is that the mechanism does not last to long. 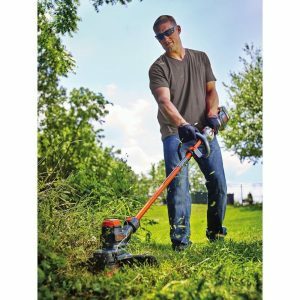 This electric weed eater (or any electric garden tool) might not be your best choice for a very big garden. For an average garden this will work great. You can find the current price here. I recommend to have an extra battery for this weed eater. There is a 1.5ah LBX1560 battery 0r a more powerful 2.5ah LBX2560 that you can use for this. You can find both of them here! My second recommendation is the EFD-080 .08″ replacement spool for this trimmer that you can find here. Toro is a brand that also have been around for a while and well know for gardening tools. 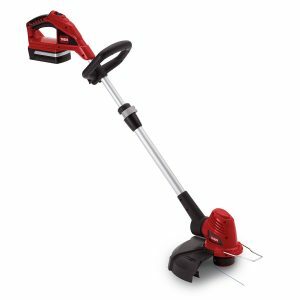 This Toro 5184 cordless trimmer is 20 Volts, but 5 Amps and that will keep it going for a while after fully charging the lithium battery pack. You can change this trimmer in an edger with a push of the button and this is easier than turning it by hand like the older models do. What I read in the customer reviews is that the packaging is very sturdy and the batter installation is straight forward. What I like about the batteries is that you can check how full they are by pushing a button. The line feeds automatically when you pull the trigger and this feature keeps the line at the optimal length at all times. The in height adjustable handle, that is made of aluminum, makes it easy to adjust it to someones height for an ideal work height. You can find the price for the Toro cordless trimmer here! I recommend to have an extra battery for this weed-eater and I found a good deal here! I also recommend these replacement spool in a 3 pack as the best deal. I was planning only to write about battery weed trimmers but I stumbled upon this combination of weed eater, mower and edger and liked it. There were over 2000 people who liked this combo and gave it an average of 4.1 stars. I still have my Troy Bilt riding lawn mower to cut my grass, but some spots are hard to reach and a small hand mower would come in handy. With this 3 in 1 machine you can have a mower, trimmer and edger in one. Reason for me to put it on my wish-list. The mower has a power drive transmission so you do not have to push it all the time. The mowing height is of course adjustable. This mover, trimmer, edger comes with 2 batteries so you do not have to stop in between mowing and trimming or edging to charge the battery. 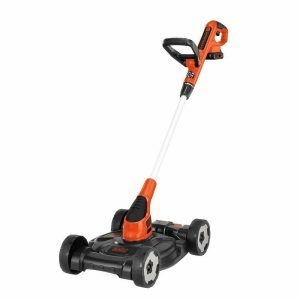 find price here for this Black and Decker trimmer, edger and mower here. Like always I recommend an extra battery even-though this one comes with two batteries already. You can find them here for the best price. I also recommend to have extra trimmer line before you run out. (Like I sometimes do). I have found a great deal here! Keep your weed eater charger and batteries dry. I like to keep mine charged so they are ready for action. 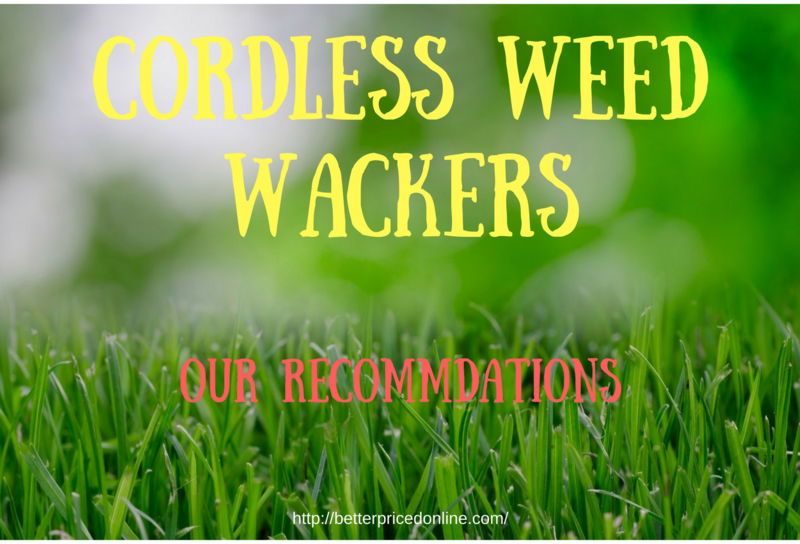 These weed eaters usually last a long time but you might need a replacement battery that is why we added them at the bottom of the models we reviewed. You might also need a new battery charger after a couple of years although mine still charges pretty good. I have found a page with almost every Black and Decker charger for you to find the one you need here! You can find a lot more garden product we reviewed here!